If you have either natural gas or propane delivered to your home, then it can be used for either space heating, water heating, a gas fireplace or cooking. And sometimes it can also be used for swimming pool heating. 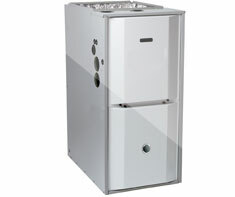 If you use gas for heating your home, then you have a Gas Furnace or Boiler. The difference between a Gas Furnace and a Gas Boiler is that a Gas Furnace burns gas to heat air for your home heating system, where a Gas Boiler burns gas to heat water (or steam) for your home heating system. A Gas Furnace or Boiler is different than a gas Water Heater, which heats just the water that is used in your plumbing for your sinks, baths, and showers. Shown in the 'Routine Care' section are the recommended routine maintenance tasks for your gas furnace or boiler. The 'Q & A' section shows answers to common questions. And the 'Articles' section provides helpful articles about your gas furnace or boiler.